A certain part of the marketing world is consumed by the power of storytelling to engage visitors. Just about everyone tells stories. No college or university I’ve yet seen takes quite the approach that Boston University (BU) takes the website home page. BU has often been a leader in website design innovation. I still remember with mixed feelings a home page of years back where key links were placed in a vertical position that forced visitors to risk a neck kink to scan what was available. Innovative for sure. 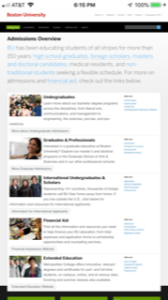 The BU home page does not place any direct emphasis on student recruitment. You may see (on a desktop or laptop computer) across the top of the page links to the usual content areas: Admissions, Academics, Research, Global, Campus Life, and About. And a place to “search.” On mobile these are hidden behind a hamburger symbol that includes “Full Menu” for people who still might not know what those 3 stacked lines mean. 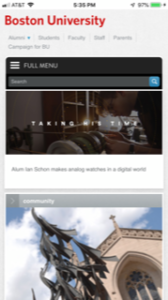 The dominant hero feature of the page is a “Taking his time” story about a BU graduate who “makes analog watches in a digital world.” The story is interesting. But this certainly is not a typical success path that very many potential students will seek to follow. As a magazine feature article, it is excellent. As dominant home page content? Perhaps. And that’s it. That’s the home page. For sure, different than most. For an immediate comparison, visit the more typical Northeastern University home page. Or University of Massachusetts Boston. Or, very likely, your own. An update: Today, on Monday morning, both the hero story and the content items below it have changed. From that, we can assume that BU intends fairly frequent updating of the home page stories. The hero story today: “Favorite Poem Project,” including a series of videos. How well will this work from a marketing perspective? Will it elevate the brand? Help achieve enrollment goals? I’ll not guess. Efforts like this depend to a great extent on selecting story features that appeal to a high percent of people visiting the home page, including potential students. Analytics will tell the tale of how well the highlighted features are working. For those that are not, I suspect replacements are in the kit bag. For visitors who are especially focused on completing top tasks as quickly as possible, this is not the best approach. Visitors on a smartphone who open the hamburger and move inside the site to, say, an overview of admissions sites will not have a nice experience. Font size is quite small and difficult if not impossible to read without finger-flicking to enlarge the size. And that, of course then requires horizontal scrolling to read the text and see the links that follow for the various admissions sites. The design works quite well for large screen visitors. But mobile-friendly it is not. Visit a truly different higher education home page and estimate the marketing strength at the new Boston University home page. Join 679 people on the Top Tasks: Higher Education Website Content group on LinkedIn.